As a fan of all things tasting menu and sushi related, I couldn't resist the omakase at Kiss before I left (wow, I really am backlogged). Kiss is located on the corner of Laguna and Sutter, and with an inconspicuous store front, you'd miss it if you weren't looking closely enough. The interior is painstakingly clean and the lighting is intimate. I have to mention that I left my little foodpad at home, so I have forgotten many of the menu items. I'll try my best to describe what I remember. 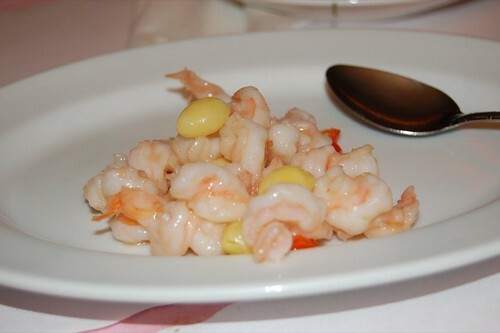 Great salad with fresh ingredients and delicate flavor. 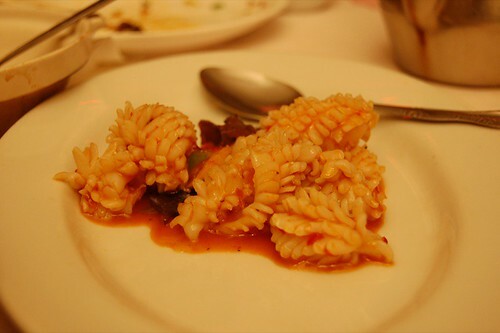 The sauce was tangy and savory, which was an appetizing way to start off the meal. I don't really remember all the ingredients in this one, but I do remember the interesting texture. The pears and broccoli were delightfully crunchy, while the sauce was grainy. The flavors were also interesting, contrasting the bitter veggies with the tart pear. 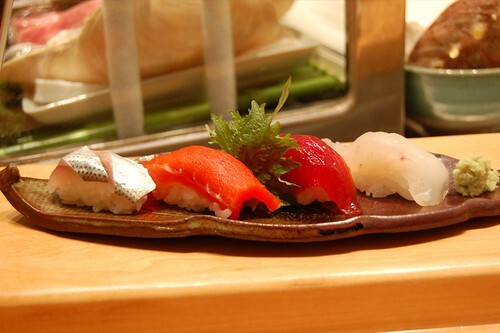 The sashimi was some of the freshest I've had in the Bay Area. 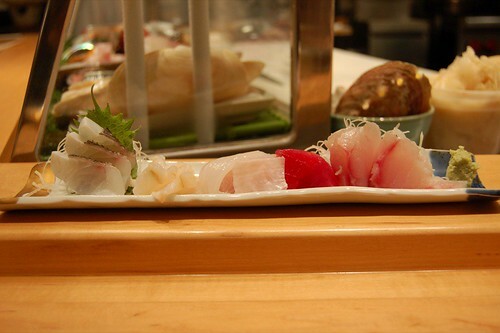 That night the chef chose snapper, squid, halibut fin, clam, and maguro. This was one of my favorites of the night. 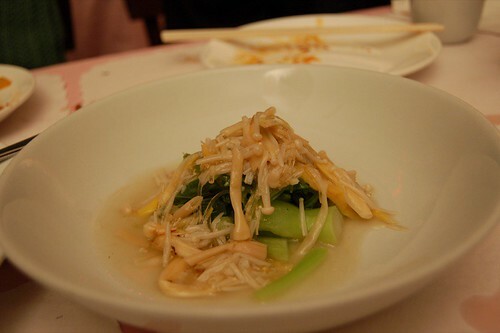 It was cooked fish layered in between pieces of crisp Napa cabbage in a fish broth. The fish was melt in your mouth and the cabbage was sweet and maintained structural integrity. The cherry blossom was a nice garnish (and tasty too!). This was probably my favorite of the night. Swimming in the vegetable broth was shittake mushrooms, snowpeas, and various vegetables. Beneath all the goodness was the smoothest, silkiest egg custard I've ever had. It was melt in your mouth and so satisfying. However, since the custard was steamed right before it arrived, it was blazing hot. I managed to burn my tongue since I couldn't resist waiting for it to cool. Oh, so I learned about the complexities protein coagulation in making custard in class today, so even more props to the chef for making this perfectly. The sushi was excellent too. 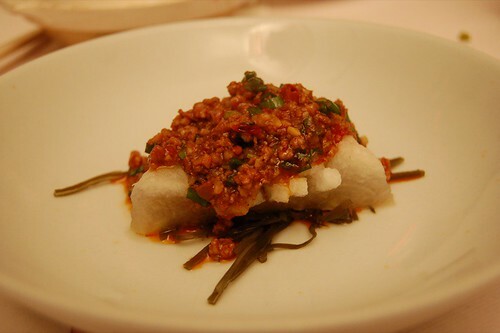 I really liked the proportion of rice to fish. The fresh wasabi was amazing too. 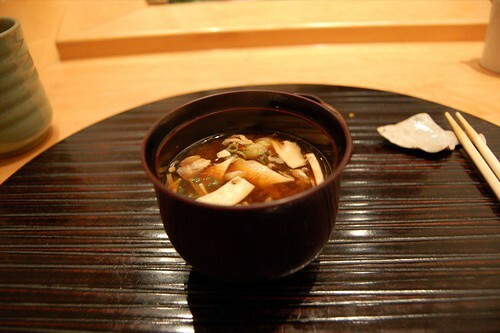 The mushroom miso soup was really good. The red miso was thick and flavorful, without being too salty like many places out there. Kyo-Ya also serves up an excellent miso. We were then brought canteloupe for dessert. I kinda wish there were a dessert as part of the omakase, but I was really full anyway--so full I couldn't even order some toro and uni as I had planned. Overall, it was a very good meal. 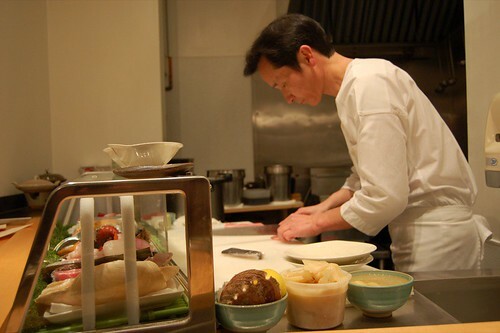 The chef is nice and chatty, and his knifework is amazing. This week I made apple pie and a fruit strudel, which turned out much better than I expected. Yay for maillard browning. 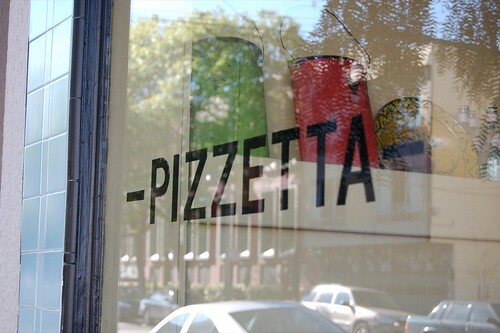 My favorite pizza place in the city goes to Pizzetta 211, a tiny shop in the Outer Richmond. After trying it for the first time over break, I was hooked and kept going back. All the ingredients are seasonal and organic, so the pizza selection changes every week, with the soups and desserts changing daily. This place seriously brought back my love of soups. I had given them up for a while, after being disappointed too many times by various restaurants. 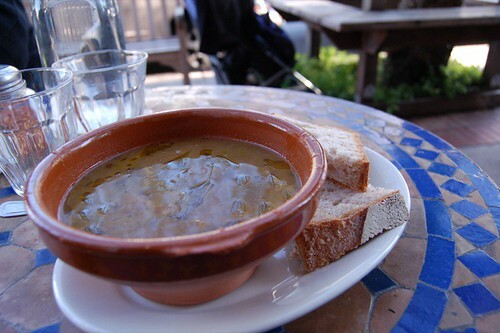 The soups here are clear yet substantial, with a generous amount of fresh ingredients. 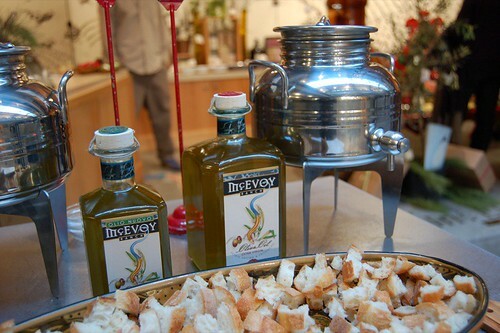 You can always taste every ingredient, and they never oversalt their soups. 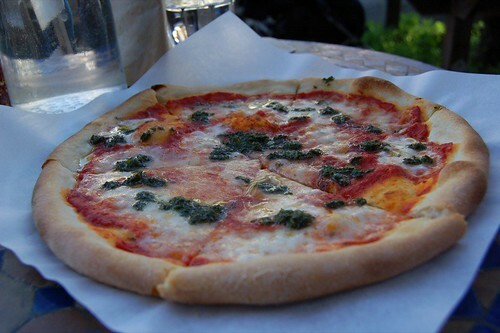 Since it was my first time there, I decided to go with the staple Margherita. The crust was thin and crispy, while maintaining the pizza's structural integrity (A16 had a very soggy center). The cheese was delicious and the sauce was fresh and pungent. Very good pizza. They also have some staple desserts, but I just couldn't pass this one up. 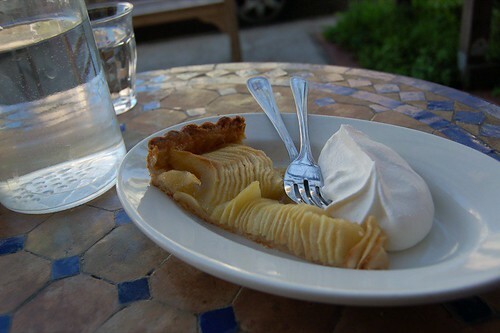 The apples were sliced thinly and delicately, and the crust was flaky and melt in your mouth. 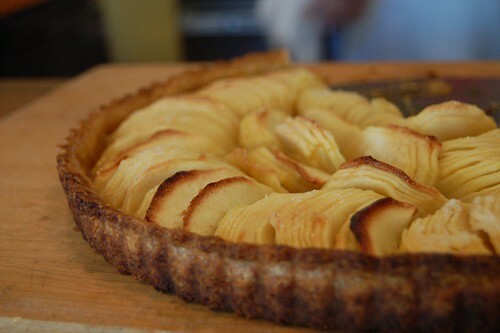 This was one of the best apple tarts I've ever had. 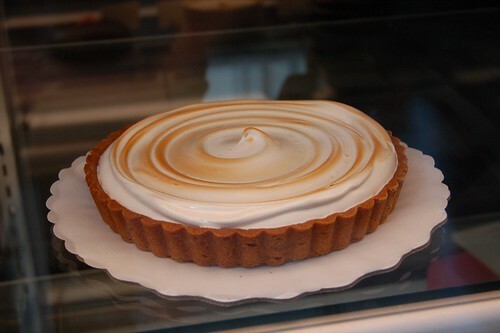 The meringue was also great--smooth and silky, with just a hint of sweetness. The only thing was the slice was so small--I could've finished at least another. It was so delicious I went back in to snap a few photos of this orgasmic tart. I have a couple more posts on Pizzetta; that place never disappoints. 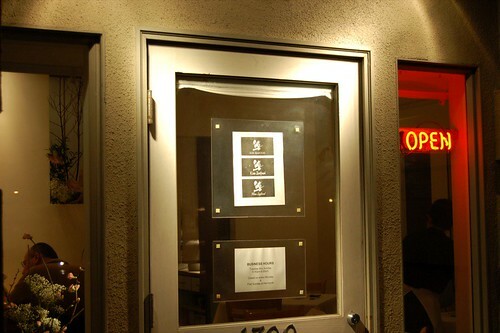 One of my favorite restaurants in Berkeley (and the Bay Area for that matter) is the Great China on Shattuck and Kittredge. 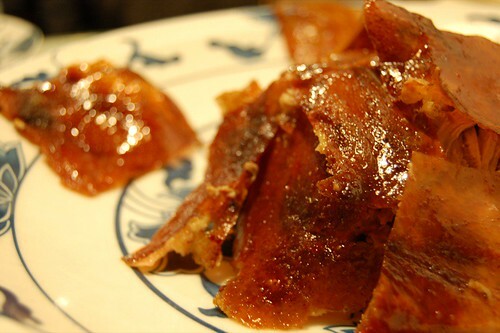 It's well known for its awesome Peking duck, but all other entrees are excellent too. 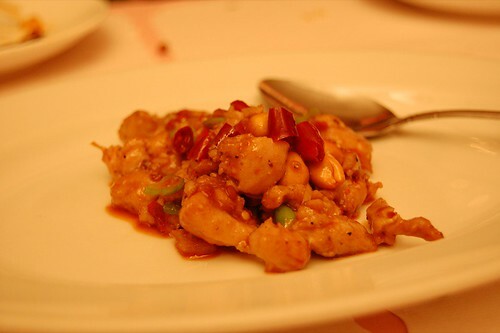 They offer a lot of specialty dishes that aren't as easy to find. 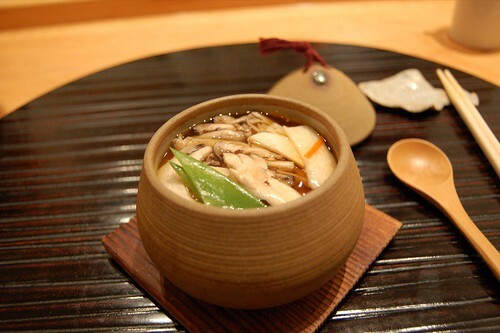 Such as this "crunchy rice" soup. 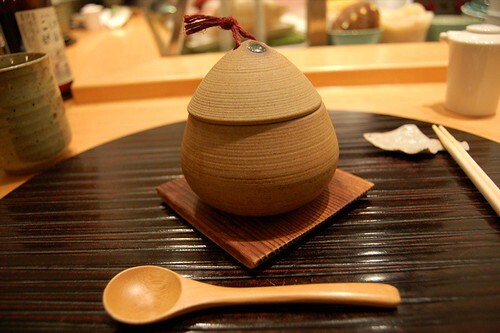 I love rice made out of a traditional clay pot. 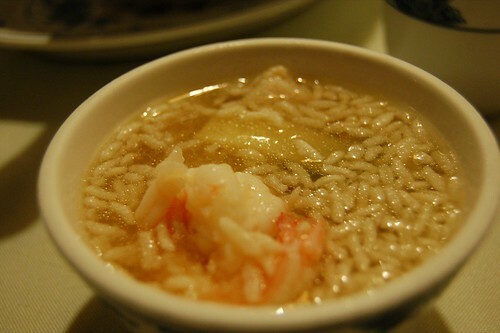 Here they have taken the crispy, slightly burnt rice at the bottom and put it into a seafood soup. Interesting combo, though I think I still prefer their mussel soup. This is another one of their famous entrees. 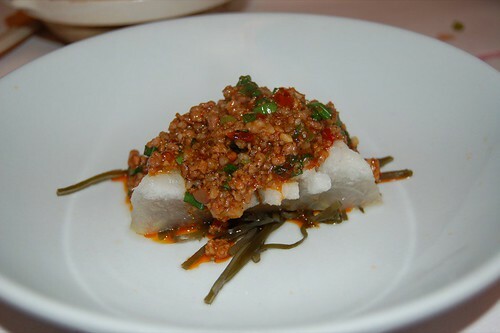 The double skin is made out of mung bean and are silky and chewy, kind of like jellyfish but to a lesser extent. 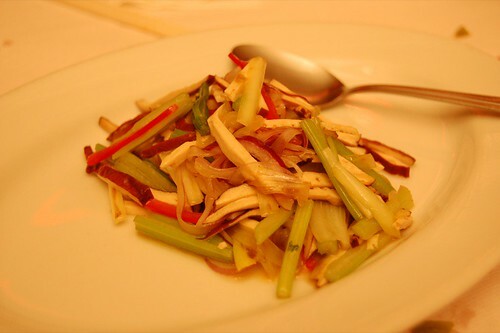 They throw in all the ingredients on the side, including cucumber, shrimp, black fungus, scrambled egg, carrots, and toss it together with soy sauce and a tangy mustard sauce. The flavors kind of remind me of cold ramen, but the sauce is def a lot more spicy. Our server got mad at me for taking the photo since he was so eager to serve it and go to other tables. This is a pretty classic Shanghainese dish, except here they use real crab meat. 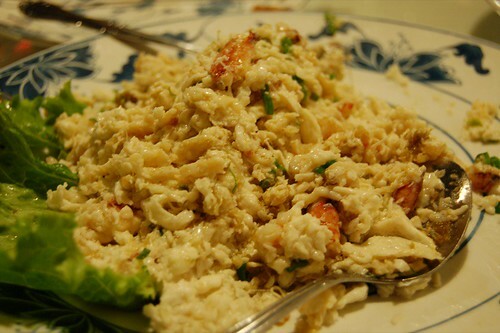 Usually places just scramble the egg whites so that they resemble crab meat. 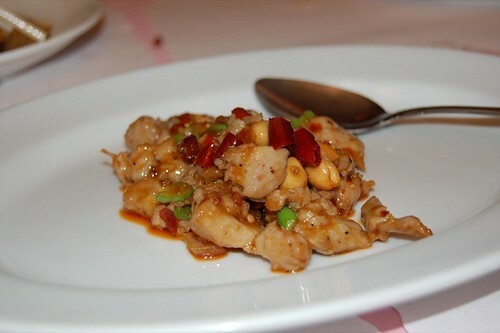 Anyway, the crab flesh is fresh and sweet, with the accent of sour and spicy vinegar. They also place a raw yolk on top and then mix it. The texture is smooth and silky. 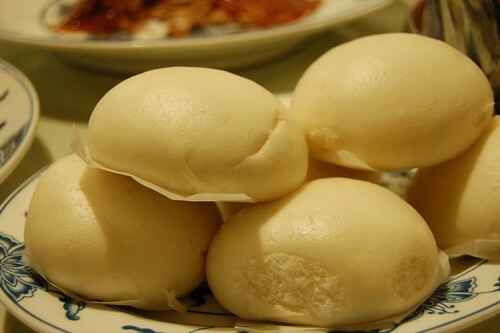 Northern Chinese cuisine is great in that you don't eat rice, but these sweet buns. They are kind of like the bun in cha xiu baos, except less sweet. Fluffy and soft, you stick the crab meat in these and it makes for an awesome crab sandwich. Now for the star of the show. 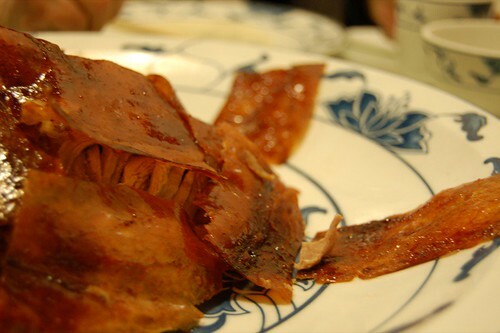 The duck is really comparable to great places in Beijing and better than a lot of places in Hong Kong. They scrape off all the fat off of the skin, making for some crispy crisp skin to put in the thin wrappers (not pictured). I really hate fatty skin since it becomes too soggy and greasy. They also give you a hearty amount of scallions, which I love. You can see that the meat is really lean. Generally, I feel that goose and duck in the US is much leaner than in Asia. 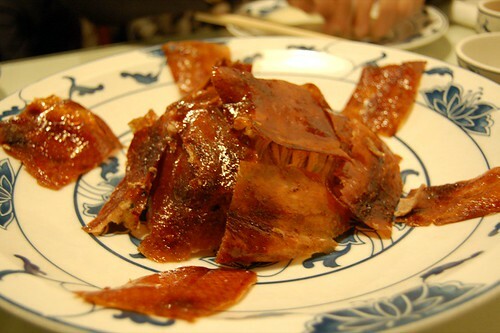 The duck meat here is really tender and lean. 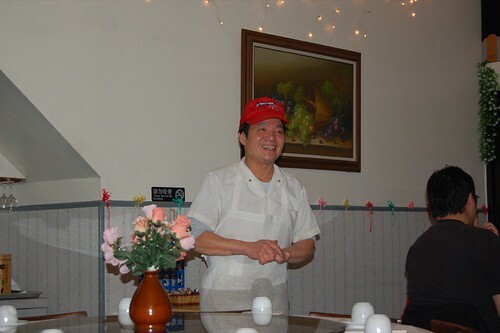 The Great China has really great food, but the service isn't something to rave about. Wait times can be pretty long, so make a reservation. 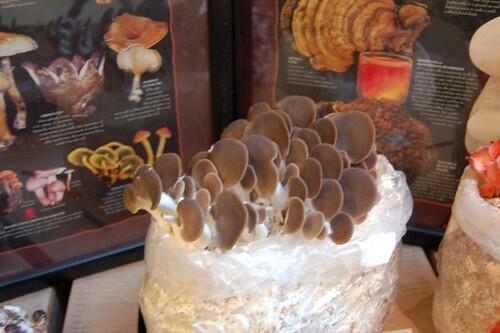 One of my favorite things in all the world is mushrooms. 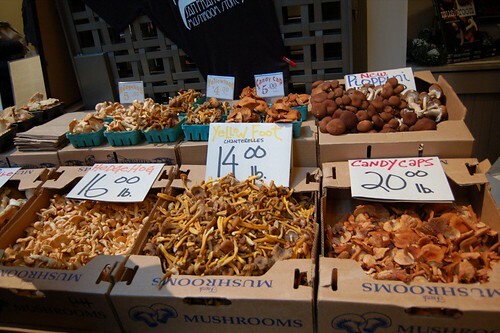 I love all varieties, and my favorites include chanterelle, shittake, morel, enoki, portabella, oyster, hen-of-the-woods, black trumpet, and, of course, truffles. I should join one of those mushroom appreciation clubs. For you shroom fans out there, there are mushroom hunting trips in Muir Woods if you're interested. 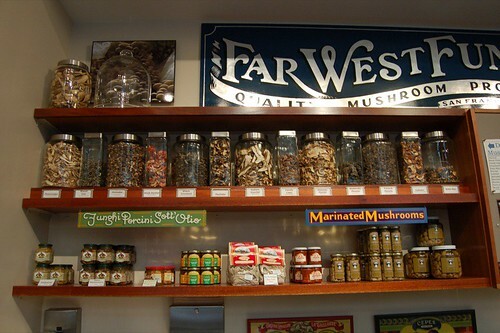 It's not a surprise then, that my favorite store at the Ferry Building is Far West Fungi. They have a good selection of all things shroom related. 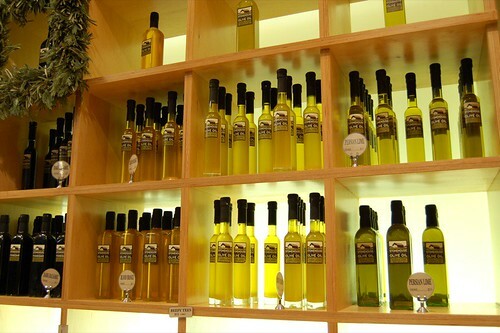 They have some pretty great truffle oils (up for tasting too!). In season they also have a few truffles, but they say they don't really carry too many. I guess I have no choice but to go truffle hunting in Alba. Outside the store they also have some mushroom fact sheets. If only all science were this fun. 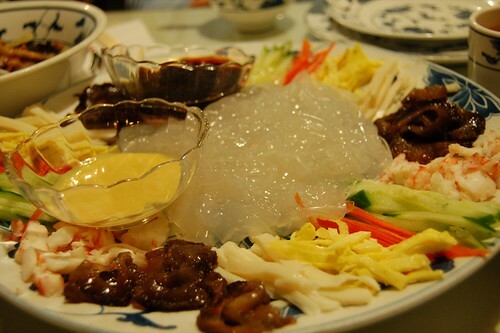 What is this mound of goop you ask? 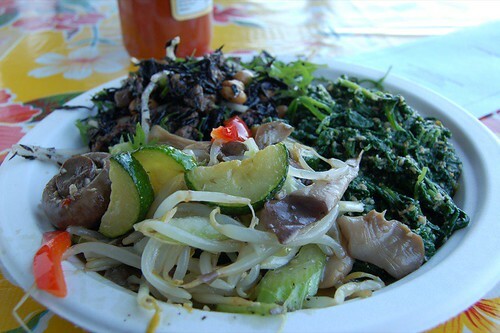 It's actually 3 salads from Delica rf-1: Mushroom salad (an assortment of delicious sauteed mushrooms, bean sprouts, celery, bell peppers, and zucchini tossed in a soy sauce-based dressing. 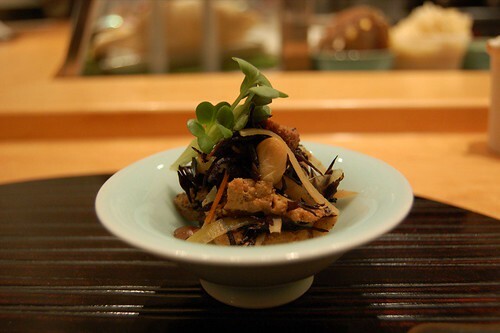 Mushrooms provided by Far West Fungi); spinach with sesame dressing; hijiki and soybean salad. It was semi bland, but just what I was looking for since this was the morning after my Jai Yun debauchery. What I wanted to get though, were the crab croquettes. 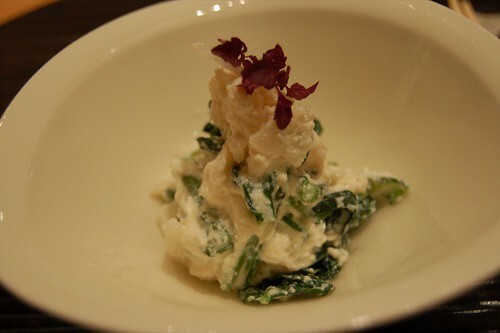 Crunchy and light batter with creamy, melt-in-your-mouth crab meat inside. So delicious! 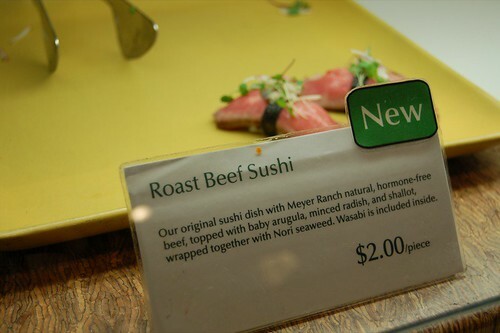 I don't really like cooked sushi, but I do like beef-it looked well marbled! More SF posts coming up and one from Ithaca too--apparently, the Northeast region's best Thai food, according to the Times. 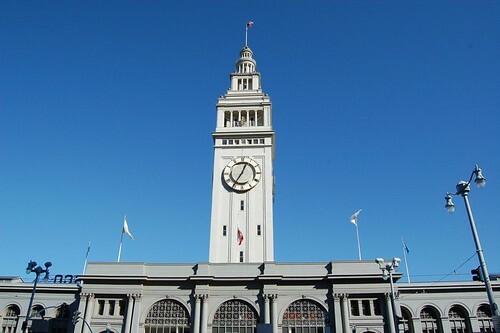 I think we can all agree San Francisco is pretty lucky to have a place like the Ferry Building. It has most of my favorite things under one roof--good bread, vinegar + oil, tea, pastries, organic produce, gelato, and mushrooms (like how I accentuate?). I managed to make a couple trips there during my break for some hedonic affairs. 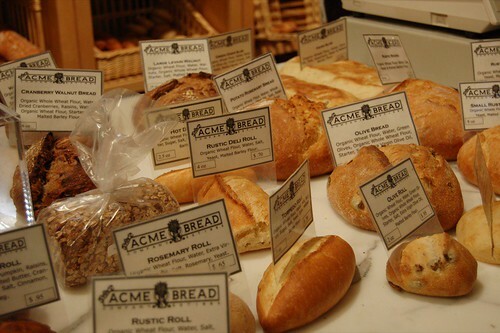 I love acme bread! It is so good I can eat it plain, though I'd prefer to submerge it in white balsamic and olive oil. I don't know if it's just me, but it is hard to depart from these samples. Every time I pass by I have the urge to just take a couple more pieces. It is really a miracle if anyone can leave the Ferry Building hungry. 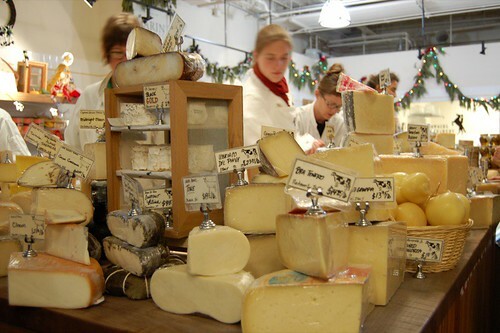 I am not a big fan of cheese (yet), but Cowgirl Creamery is a good source (aka MC's dream). Their selection is pretty comprehensive and the staff is knowledgable in their pristine white lab coats. 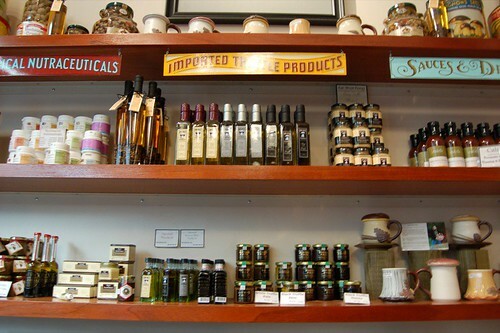 They do sell 2 products that I buy on a regular basis, though: Straus Family Creamery organic milk and Wallaby Yogurt. Napa based Wallaby makes some of the best Australian style creamy yogurt. They carry them at Andronico's and Whole Foods. While I am on the subject of cheese, I should mention that I had the chance to eat a cube of very strong Roquefort in culinary class. Because my palate is still quite uncultivated, it was not pleasant. If I weren't in class, there is no doubt I would have spit it out. 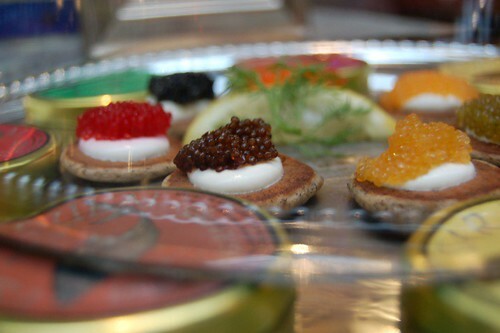 Ok, I've posted the caviar pic before but I like it so here it is again. 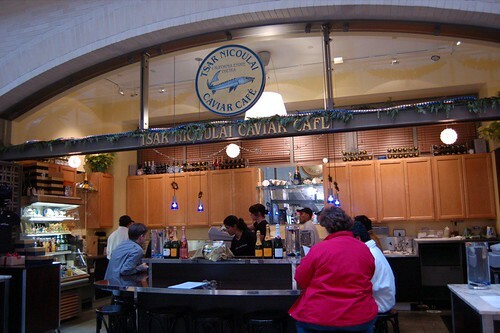 I haven't eaten here yet but I'd like to go for the caviar tasting menu. If it's as good as it is aesthetically pleasing, I'm satisfied. 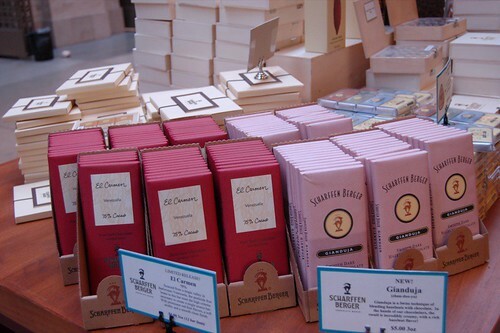 Scharffen Berger is probably my favorite brand of chocolate after Valrhona. 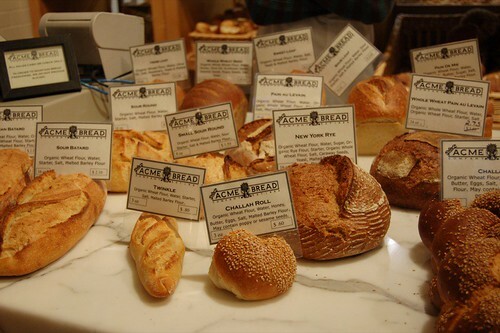 There is no need for me to shop here though, since most of my favorite restaurants already use their products: Tartine for the hot chocolate, Pizzetta for the chocolate cake. Next time I'll have to tour the factory. I am not a big fan of cupcakes (how dare I?!). I just feel they're so....dainty. Too weak to be a muffin and not fancy enough to be a cake. 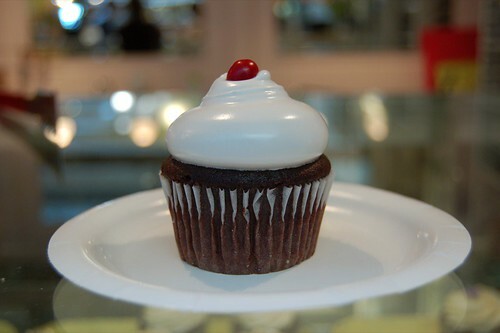 I did get to taste a crumb though--it was ok. My companions felt that the cupcakes at Patisserie Miette weren't as good as Citizen Cupcakes though. The best part is coming up (hint: mushrooms). Sorry for the lack of updates--I've been extremely busy with my classes in full swing, one of which is a culinary class! The course is pretty intense though--two 75 minute lectures and a 3 hour lab. I have to say that being a chef is damn hard. Just the mise en place takes me forever because I'm so inexperienced. Another thing is the pacing; when you have to prepare 3 things simultaneously, you have to decide which steps to take depending on which foods oxidize or turn limp. Last week we made chocolate chip cookies from scratch and today we made cream of broccoli, autumn vegetable soup, and a cobb salad. Besides the cooking aspect, I've also been learning a lot of culinary terms which will make this blog juuuuust a bit less amateur. I am sure there will be many lab blooper stories to come. Continued from my last post, I mentioned how the lighting at Jai Yun somehow turned dim. I really dislike taking pictures with flash, but I will include them underneath since it is difficult to discern what the food is. 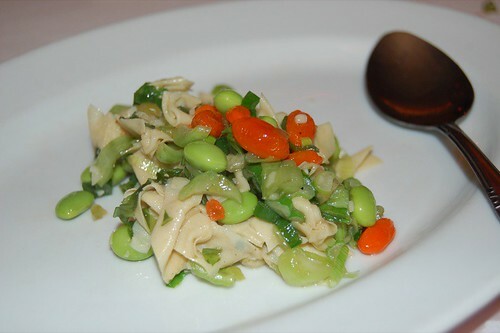 The first entree to arrive was this delicious abalone dish. 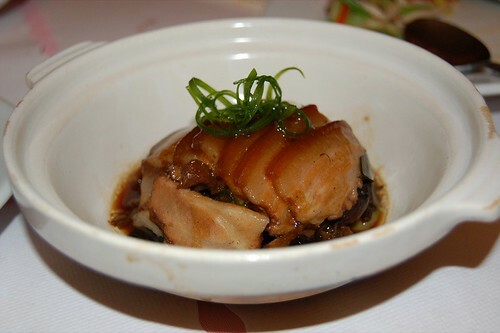 The abalone was fresh, tender, and juicy, not at all chewy or overcooked. 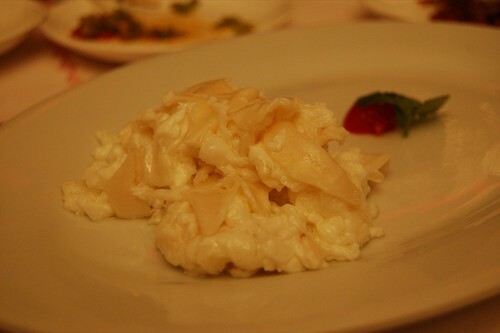 The egg whites were silky, smooth, and delicate. The pairing of ingredients was great and the contrast of hard v. soft was interesting too. This entree was good, but nothing too outstanding. 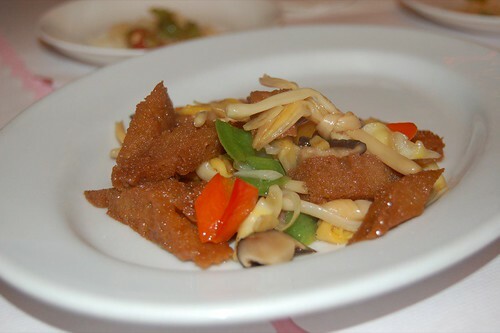 It was an interesting mix of textures, with the spongy gluten and the crisp vegetables. I really enjoyed this one. 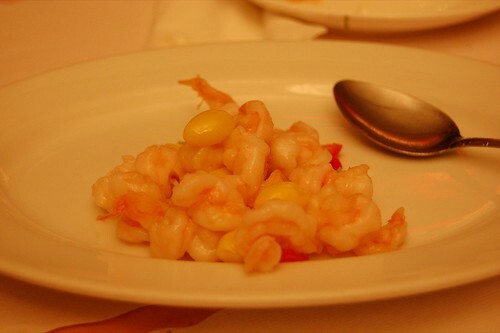 The shrimp was fresh and crisp; the subtle bitterness of the ginko nuts really brought out some of the more "hidden" sweetness of shrimp. 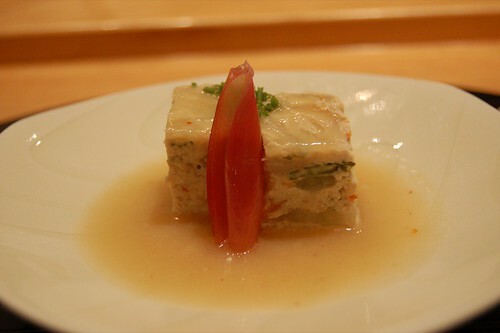 I was extremely impressed by the thin tofu skin. After I had the real thing in Shanghai, I've searched far and wide in the States (fine, Bay Area and New York) for something similar. The skin here was just as smooth and tender, evident that it was probably home made. 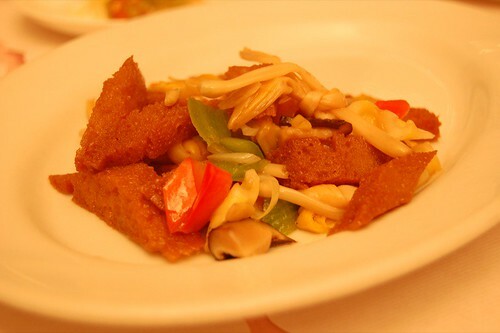 The picture to the right is fresh tofu skin with Chinese vegetables at some hotel in Shanghai. I'm sure Chinese menus everywhere have something by the same name, but not many look like this. 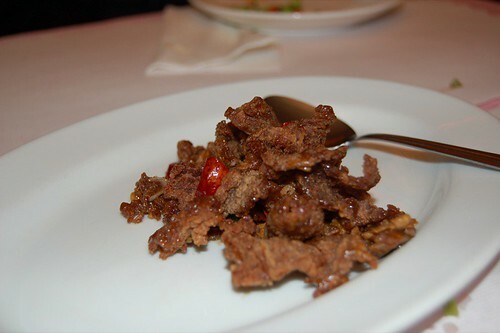 The beef was delicious--thinly sliced and crunchy, delicately light and not greasy. It had just a hint of sweetness and slices of fresh orange zest really made this entree delicious. At my size, it is truly a wonderment to many how much I eat. At this point, I am getting a bit full; not just sated, but full. Having had the 8 appetizers and 6 entrees so far, I was beginning to get a bit overwhelemed. But I ate on. 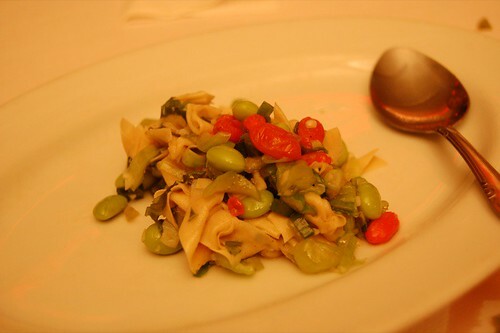 This entree was another one of the vegetable stir-fries. Good, but not outstanding. This was another one of my favorites. I really do commend the chef for his excellent pairing of ingredients and textures. 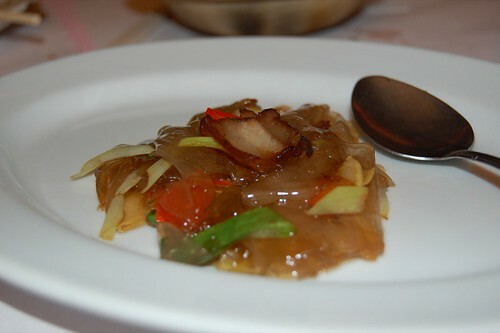 The wintermelon was juicy and sweet, while the meat was savory and spicy. 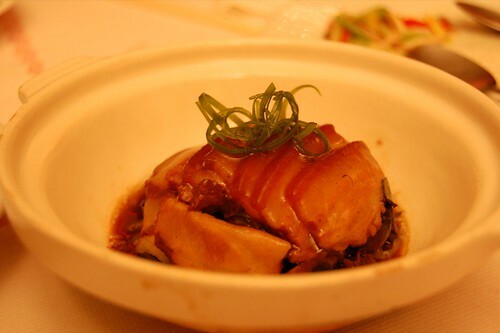 Unlike the pork belly, this didn't have to be served with any starch because the melon acted as a foil. When this arrived, the waitress warned us that it was quite spicy. I consider myself to have a pretty high spiciness tolerance, but this was seriously damn spicy. It doesn't really hit right away, but after a while your mouth just gets quite numb. That said, I didn't stop eating it. 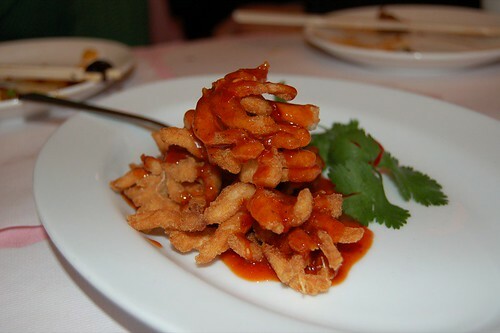 The squid was tender and fresh; also notice the chef's detailed knifework. His attention to detail is amazing. The official starch of the night was also very good. 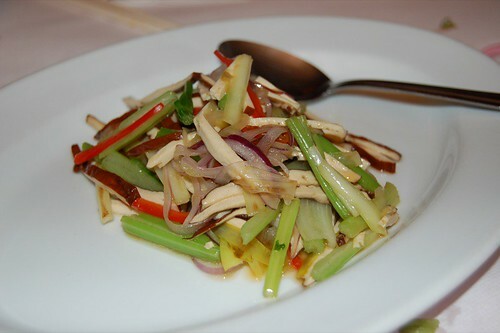 The sheets were thin and chewy, and the stir fried fennel really added great aroma. 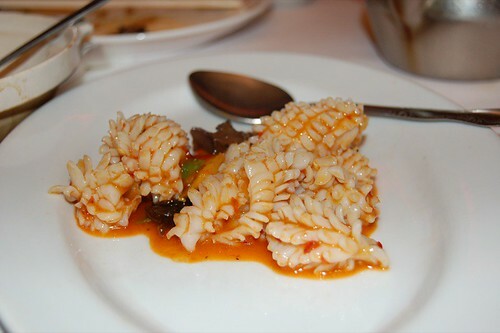 This was probably my least favorite dish of all. The sauce was excellent--tangy and sweet without overwhelming the meat. However, the chicken was way too fatty and tender to be free-range. I was disappointed. 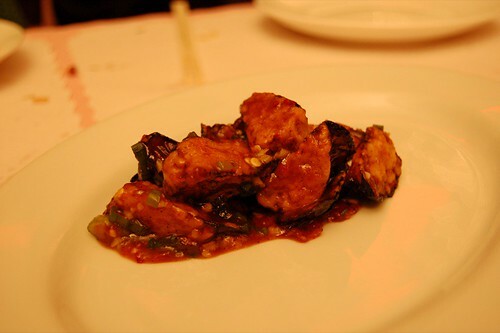 Hands down, this was the best ever eggplant dish I have ever had (and I have had my share). 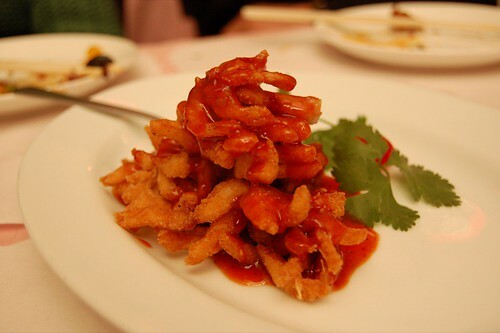 The pieces were lightly breaded and fried so delicately that the outer layer was just carmelized and crispy. The sauce was tangy, sweet, and garlicky. When you bite into one, it just bursts with flavor. I remember every bite like it was just yesterday. 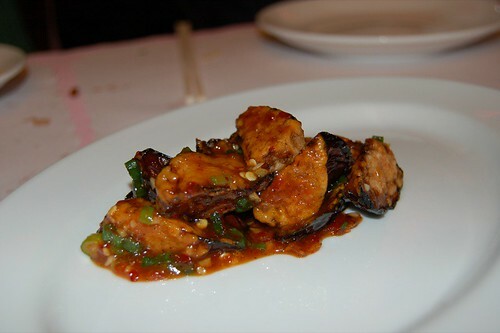 The eggplant was the star of the meal. Another good one; great crisp and great sauce. But nothing can taste good after the eggplant. This was the last entree of the night, and was indeed a palate cleanser. 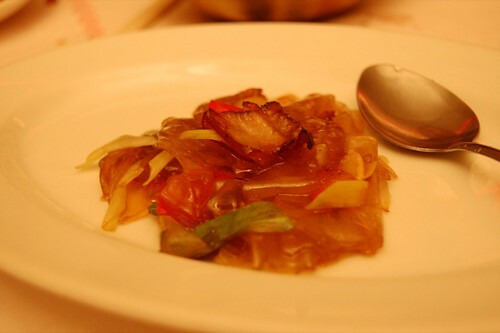 I didn't feel like we were eating the highest grade shark's fin, however. But overall this one was good. Jai Yun was quite the eating experience. I am sure you as a reader are quite saturated just reading my post. I arrived at Jai Yun still full from another Tartine run but still ate til I could eat no more. I seriously wanted to call for a stretcher to carry me out. Overall, all the dishes were good, but I can't say all were outstanding. There were definitely a few standout dishes, such as the smoked fish, pickled cilantro, egg white + abalone, and the eggplant of my dreams. 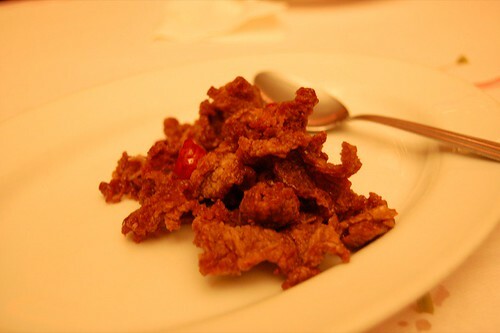 I think the chef excels most at interesting ingredient parings and above all, a daring contrast of textures. 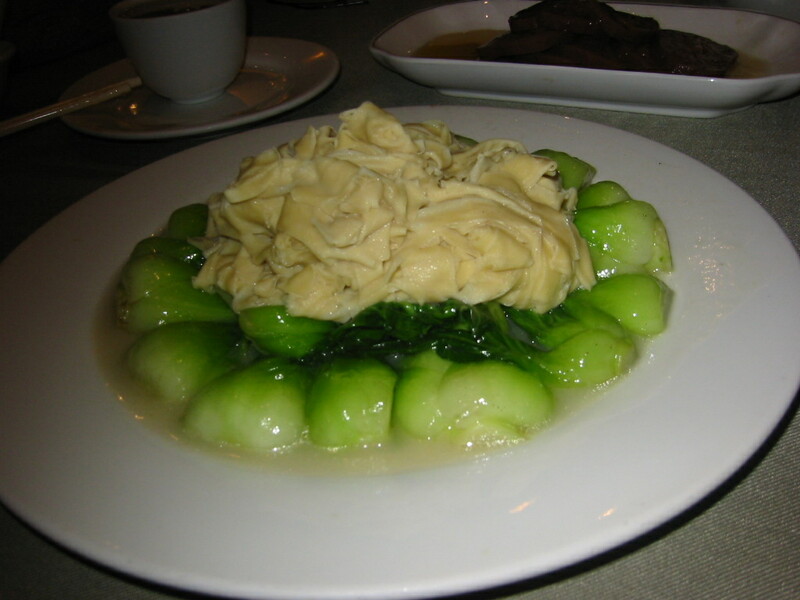 It is also worth noting how he varied his dishes, vegetable after meat and sweet and savory. As soon as I left the restaurant, all I knew was sensory overload. But with my tight schedule of eats, I had a nice cleanse of the palate the next day at Delica rf-1 and the omakase at Kiss Sushi a few nights after; I'll blog that next.